CISV educates and inspires action for a more just and peaceful world. A long-standing member of our Chapter Board, this past year Connie took on the role of Communications Chair. 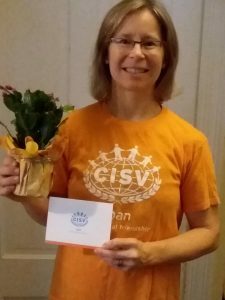 Connie brought a lot of enthusiasm and dedication the job of spreading the word about CISV Maine across many fronts. She formed a Communications Team, which recently launched our new website. Connie also was an essential part of our Mosaic Program, Harvest for the Homeless. She was a key member of the Garden Committee, as well as a tireless volunteer in the garden itself. Thank you, Connie, for all your hard work this past year! Maine, CISV USA, CISV International Ltd.